Bungoma bounced back to win after losing the opening match to Kakamega High. Cheptil (green top) against Rusumo during their match which lasted for slightly over two hours with Rusumo winning 3-2 in a repeat of 2015 final. Erick Otieno steered Bungoma High School rugby 15's team to a 28-0 win over Uganda's Makerere School in the Federation of East Africa Secondary School sports Association games at Eldoret Sports Club. 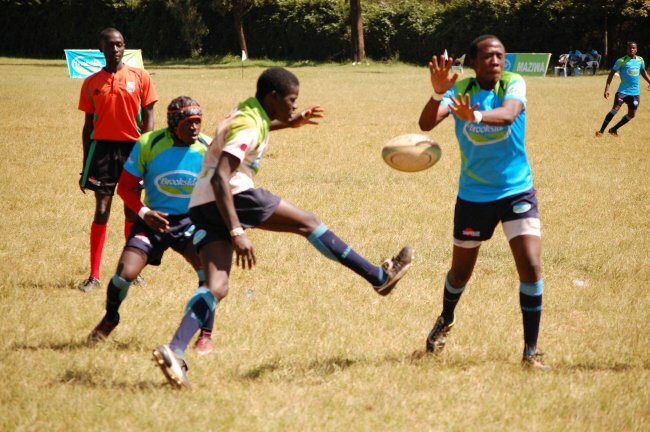 Bungoma bounced back after losing 9-21 to Kakamega High in their opening match. Against Makerere School, Bungoma were dominant. Otieno kicked over a penalty for Bungoma before crossing the white wash. His conversion bounced off the posts but Bungoma led 8-0. Otieno converted a penalty and scored his second try for a 16-0 lead. Ten minutes after resumption, Elisha Ndeche added another try and Otieno converted to stretch the lead 23-0. Makerere soaked pressure and Beldad Ogeta scored a try with six minutes left. Kenyan Hanna mixed lost the other rugby match to Ugandan Namiylango from Uganda 17-15. In this match, Brian Oroma scored two tries for Namilyango. Mark Semakula added two conversions. Semakula added a penalty as Namilyango led 17-0. Hanna replied with 15 points from a try each by Stephen Alul, Swali Vicyor and Seguya Wilfred. Kenyan volleyball girls dominated the afternoon sessions in volleyball with AIC Kosirai and Soweto victorious at Eldoret Polytechnic ground. AIC Kosirai who lost to Soweto on Monday bounced back to beat win St. Aloys of Uganda 3-0 (25-15, 25-23 and 25-22). Soweto beat Ugandan side Kinawa in a four-setter in pool B. Soweto won the first set 25-8 and Kinawa won by the same margin before Soweto took the next two sets 25-11 and 26-24. Apapen College from Rwanda beat Uganda's Buremba Boys 25-19, 25-10 and 25-19 in Pool B while former regional champions Malava Boys edged out Uganda's St. Mary’s Kitende 3-1 (25-19, 17-25, 25-16 and 25-20). It was a final before a final in boy's Pool A match between Kenyan champions Cheptil Boys and games' defending champions Rusumo from Rwanda. The match was a repeat of 2015 finals in Rwanda where Rusumo beat Cheptil to lift the title and the results were the repeat of the 2015 final where Rusumo beat Cheptil again in in two hours and six minutes in a five-setter thriller. Rusumo won the opening set of 25-17 before Cheptil took the second 26-28. Rusumo bounced back to win the third set 25-23 and Cheptil the fourth on 25-21. The decisive fifth set went to Rusumo 15-13. Lycee de Nyanza defeated Luyanzi of Uganda 3-2 (24-26, 26-24, 23-25, 25-22 and 15-08) in another Pool A match. In the girls’ category, Indangaburezi from Rwanda easily defeated Kenya's Sega Girls 25-21, 25-14 and 25-20 in Pool B. Lugulu beat Trust High from Uganda by similar margin in 25-13, 26-24 and 25-8. Sinyolo Girls have had a good outing in defending their hockey title. On Tuesday Sinyolo overran Uganda's Nyamagunga 14-1, the highest scores in the championship. Another Kenyan side Kerugoya Girls, who finished third in Rwanda last year, drew 0-0 with Tigoi Girls while Kakungulu from Uganda beat their Ugandan counterpart Old Kampala 5-0. Multiple hockey national champions Friends School Kamusinga defeated Uganda's Ntare 9-2 while St. Charles Kasasa of Uganda drew 0-0 with Kakungulu (Uganda). In another Kenyan affair, St. Anthony’s Kitale defeated Upper Hill 2-0. Substitute Fredrick Otieno scored a brace as Bukembe Secondary from Kenya came from a goal down to beat Lt St. Basile of Burundi 2-1. The win for Bukembe in in Group C, was not just on the field. Fans celebrated by carrying their bicycles. They included Kennedy Wafula Wepukhulu who gobbled the limelight by peddling to Lodwar to cheer his team. He has also used his bike to go to Kisumu and Eldoret. In this match, Pascal Niyonkuru had given Basile the lead after 19 minutes. They resorted to time wasting by their goalkeeper Rochagie Nahimana. The goal was scored after Niyonkuru sped past three defenders and shot in the right corner with Bukembe’s goalkeeper Jeremiah Mesuswa beaten. Bukembe fans, chanted and cheered their team and were rewarded in the 35th minute when Wycliffe Wanyonyi equalized for a 1-1 score at half time. In the second half, Bukembe exerted pressure and a strike from Otieno with his first touch resulted in a goal in the 46th minute. He fired from outside the 18 after receiving a low cross from Norman Anorpheno on the left. Otieno who was thorn in the flesh of Basile flesh’s defence doubled his score on the 70th minute when he capitalized on defence confusion after defender Gloire Ngendakurumana headed to his goalkeeper Nahimana. The ball was too short and Otieno tapped into an empty net for a match to end on a 3-1. Defending football champions St. Mary’s Kitende from Uganda overran Rwanda College, Gisenyi 3-0 in Pool C. Alex Omakach scored the first goal from the spot in the 13th minute for a 1-0 lead at half time. On resumption, Michael Male added the second in the 46th minute before Disan Galiwango netted the third goal for Kitende to lead Pool C with three points followed by Bukembe with similar goals but an inferior aggregate. Early, Uganda's Kibuli SS drew 0-0 with Hanika TSS of Rwanda in Pool A match. Both teams were reduced to 10 each after Willy Amza Gymana of Hanika and Kibuli’s George Kiryoma were shown the red card for fighting on the pitch. In the girls' category, Kenyan champions St. John's Kaloleni defeated Tanzanian side Alliance 3-0 in Pool B while Rwanda's GS Remera beat Masaka from Uganda 2-0.